Ashley Roye is the office manager at the SERVPRO of Orange/Nederland/Lumberton. She has several years of experience in HR and running the day to day business. She has been employed since 2013. She also has SERVPRO Employee Certification Training Program certificate and Water Damage Restoration Technician from the Institute of Inspection Cleaning and Restoration Certification (IICRC). 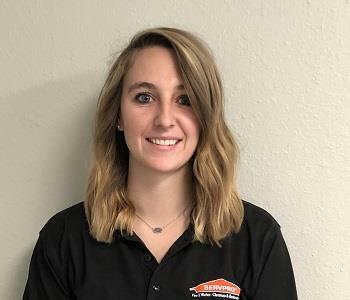 Jacey Woods is a Sales/Marketing Representative for the SERVPRO of Orange/Nederland/Lumberton. Jacey has been with the company since 2015 and graduated from Lamar University with two degrees. She is constantly in the community giving back. Jordan Callahan is the Operations Manager for the SERVPRO of Orange/Nederland/Lumberton. Jordan has several years of experience and has the following certifications from the Institute of Inspection Cleaning and Restoration Certification (IICRC): Water Removal Technician (WRT), Applied Structural Drying Technician (ASD), Fire & Smoke Damage Restoration Technician (SRT), and Lead-Based Paint Activities and Renovation. Jordan has been employed with the company since 2012. Ethan Rivera is a Crew Chief at the SERVPRO of Orange/Nederland/Lumberton. He has been employed with the company since 2015. He is certified as a Water Removal Technician from the Institute of Inspection Cleaning and Restoration Certification (IICRC). Carlos Arellano is a Crew Chief at the SERVPRO of Orange/Nederland/Lumberton. He has been employed with the company since 2017. He is certified as a Water Removal Technician from the Institute of Inspection Cleaning and Restoration Certification (IICRC). Maria Escareno is a Production Technician for the SERVPRO of Orange/Nederland/Lumberton. She has been employed with the company since 2012. She usually handles fire clean-ups and is certified in the SERVPRO Employee Certification Training Program. Lidia Ramiro is a Production Technician for the SERVPRO of Orange/Nederland/Lumberton. She has been employed with the company since 2013. She usually handles fire clean-ups and is certified in the SERVPRO Employee Certification Training Program. Jocelynn Harris is an Administrative Assistant at the SERVPRO of Orange/Nederland/Lumberton. She has been with the company since 2018. She is certified in the SERVPRO Employee Certification Training Program. Jocelynn graduated from Oklahoma State University.